Several large, non-native lizards and snakes are now breeding in central and southern Florida. Some of these species, such as the Nile Monitor lizard and Burmese Python are dangerous carnivores and are probably harming our native ecosystem. Other species, including the Anacondas, have been found in Florida but aren't established and breeding... yet. Early detection and rapid response networks are the key to preventing new species from being introduced and keeping established invaders from spreading to new areas. 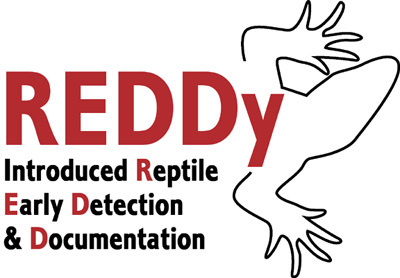 REDDy is a free, online course that will teach you how to recognize and report large, invasive reptiles. REDDy-trained observers play a key role in a much larger management program by helping to detect and document the spread of established species and sightings of new species. Anyone who spends time driving, working outdoors, or enjoying the outdoors will benefit from this training, as will anyone who lives in southern or central Florida. REDDy is provided by ECISMA, created by UF with the National Park Service and The Nature Conservancy, and funded in part by the South Florida National Parks Trust, Ferris Greeney Family Foundation, and USDA-RREA. Web hosting for REDDy was made possible by Dr. Howard Beck and Li Tao.